Note: Actual production from Canada through October 2014. November and December 2014 totals estimated. Canadian shale gas production total includes the Montney formation. Republished February 13, 2015, 10:30 a.m. to clarify China and Argentina's production of shale gas and tight oil, respectively. The United States, Canada, China, and Argentina are currently the only four countries in the world that are producing commercial volumes of either natural gas from shale formations (shale gas) or crude oil from tight formations (tight oil). The United States is by far the dominant producer of both shale gas and tight oil. Canada is the only other country to produce both shale gas and tight oil. 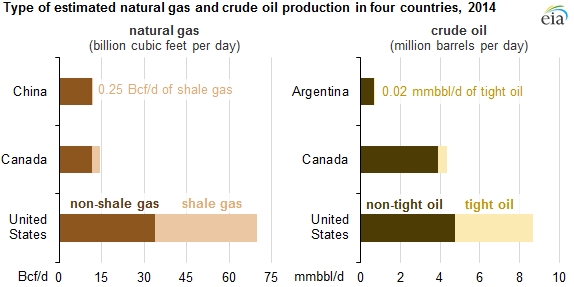 China produces some small volumes of shale gas, while Argentina produces some small volumes of tight oil. While hydraulic fracturing techniques have been used to produce natural gas and tight oil in Australia and Russia, the volumes produced did not come from low-permeability shale formations. The four countries producing commercial volumes of shale gas and tight oil all increased output in 2014, and in all four countries, natural gas and crude oil production from shale and tight formations grew at a faster rate last year than production from non-shale and non-tight formations. In the United States, a large portion of shale gas production growth has occurred in the Appalachian Basin's Marcellus Shale. In the Marcellus region, dry natural gas production has more than tripled in the past three years, from an average of 4.8 billion cubic feet per day (Bcf/d) in 2011 to an average of 14.6 Bcf/d in 2014. A large portion of tight oil production has come from Western Gulf Basin's Eagle Ford and from the Williston Basin's Bakken Shale. In the Bakken region, oil production in 2014 averaged 1.1 million barrels per day (bbl/d), more than 2.5 times greater than the 2011 average of 0.4 million bbl/d. In Canada, tight oil production doubled between 2011 and 2014, from 0.2 million bbl/d to 0.4 million bbl/d. Most Canadian tight oil production comes from Alberta and Saskatchewan. The same is true of Canadian shale gas production, which increased from 1.9 Bcf/d in 2011 to 3.9 Bcf/d as of May 2014, when including production from the Montney formation (natural gas produced in the Montney formation is considered non-shale gas production by the Canadian National Energy Board, but is included in the Canadian shale gas production total). In China, Sinopec and PetroChina have reported commercial production of shale gas from fields in the Sichuan Basin. Their combined shale gas output has reached 0.163 Bcf/d, or 1.5% of total natural gas production. In Argentina, tight oil production comes mainly from Vaca Muerta’s Neuquen Basin. National oil company YPF, partnering with Chevron, is producing about 20,000 barrels of tight oil per day from the Loma Campana area. Notable shale resource exploration efforts are underway in several countries, including Algeria, Australia, Colombia, Mexico, and Russia. However, commercial shale development of the type demonstrated in the United States requires the ability to rapidly drill and complete a large number of wells in a single productive geologic formation. The logistics and infrastructure necessary to support this level of activity, including the drilling and completion processes, the manufacturing of drilling equipment, and the distribution of the final product to market are not yet evident in countries other than the United States, Canada, China, and to some extent, Argentina. Other above the ground factors such as ownership of mineral rights, taxation regimes, and social acceptance also play a role in decisions regarding the development of shales and other tight resources.